‘Ginormous’ Glaciers: It would be easy to miss the Zodiac carrying about a dozen guests from Seabourn Quest. Spending an afternoon on Zodiac tours in the Lemaire Channel, guests marvel at glaciers and the sheer immensity of Antarctica. © 2014 Avid Travel Media Inc.
Look closely. Can you see the orange parkas against the Windex-blue glacier? They’d be easy to miss, the 10 or so Seabourn Quest guests in the Zodiac, exploring a massive glacier on one day of our voyage to Antarctica. I remember the day well. A group of us were on another Zodiac, far enough away for me to snap this photo with a zoom lens. We were all mesmerized by the magnitude of the place, a vast emptiness, except for mountains of rock, ice and snow all around us. Seabourn Quest was anchored nearby, and it appeared like a speck on the water that I will share later this week. Antarctica surely humbles those who visit. First, there is the sheer amount of ice. Nearly all of Antarctica is covered by ice that averages more than one mile in thickness. There are hundreds of glaciers, such as the one we admired for close to an hour in the Lemaire Channel. I realized as we cruised along side the glacier that the glacial face is a thing of rare beauty, with its elongated, deep cracks. Calving will occur at some point when huge chunks of the glacial face break off and plunge into the water. The calving sounds like the firing of a rifle. The next sound you hear is quiet, followed by rippling water caused by the chunk of ice displacing the water. Antarctica can be remarkably quiet. 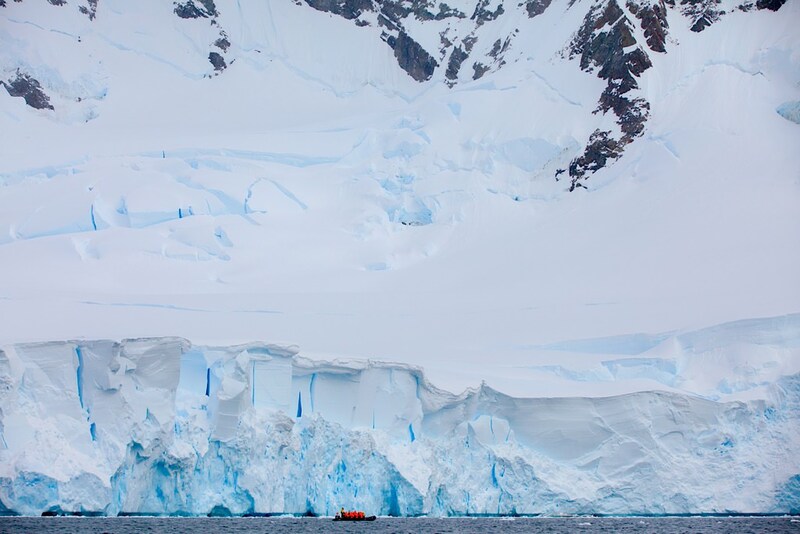 One of our Zodiac drivers said to us on an outing, “One of my favorite moments in Antarctica.” He shut off the engine. None of us said a word for what seemed like five minutes. We listened to the vast stillness. Few of us had ever heard anything like it. Ralph, I enjoy your descriptions of your cruises. I have to ask how you compare this Antarctic trip to the one you had on the Silver Explorer last year? Both of my Antarctic journeys, one on Seabourn Quest and the other on Silver Explorer, were similar in one way: I left Antarctica feeling as though I had experienced the grandeur of the White Continent. So in terms of the overall experience, both deliver it in ways that are more than satisfying. Onboard, each ship, Silver Explorer and Seabourn Quest, has its own plusses. Seabourn Quest has multiple dining venues, multiple lounge and entertainment outlets, large fitness area and spa, and balconies for nearly all staterooms. Silver Explorer has intimacy, butler service, and fewer passengers to land ashore on Zodiacs (132 guests vs. 450 guests). Those are the biggest differentiating factors between the two products.